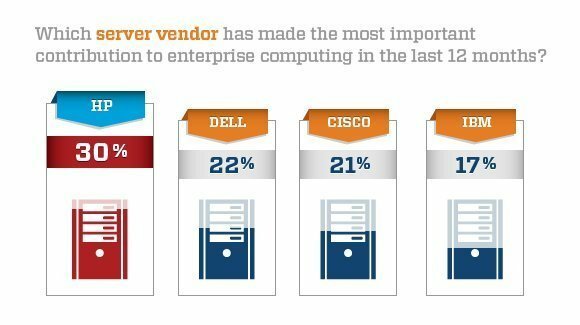 Survey respondents agree on the four top server manufacturers, with HP edging out Dell, Cisco and IBM. Server innovations from these big four are improving data center performance and efficiency. Hewlett-Packard Co. made the most important technological contribution to enterprise data centers, according to more than 30% of respondents who answered the server questions. About 37% of the IT professionals who responded said HP was their primary server vendor. About 22% of respondents chose Dell Inc. for the most advanced server company; 21% chose Cisco. IBM rounded out the top four at about 17%. These companies' server innovations have improved data center and workload performance, as well as system management. The best servers offer enterprise compute capabilities without compromising energy efficiency and are also attuned to enterprises' need for high availability, respondents noted. But reliability and total cost of ownership/price were the leading factors in server purchasing decisions.